RAVENOL oils and lubricants have been made in Germany since 1946! RAVENOL is famous throughout Europe and is known for setting the world standard in advanced lubrication technology. 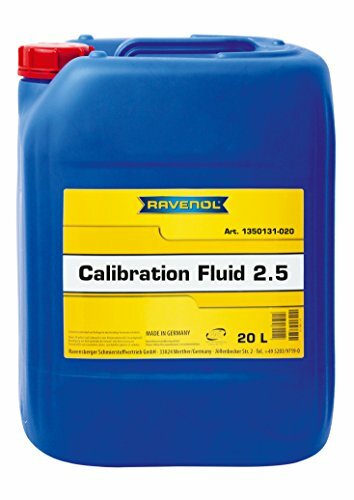 RAVENOL Calibration Fluid 2.5 is a low viscosity test fluid for the calibration of diesel injection pumps with a very close viscosity tolerance. It provides excellent wear-, corrosion-protection and a low foaming tendency. The product is also suitable for use as a corrosive protectant for the internal preservation or conservation of fuel systems from MTU. RAVENOL Calibration Fluid 2.5 is used as a test fluid for the calibration of diesel injection pumps from Bosch (VS 15665-OL), MTU, MAN, and Volkswagen. The product is also suitable for use as a corrosion preventive oil for the internal preservation or conservation of fuel systems from MTU. If you have any questions about this product by Ravenol, contact us by completing and submitting the form below. If you are looking for a specif part number, please include it with your message.